The Horse Chestnut leaf mining moth (Cameraira ohridella) is an insect pest which lives in Horse Chestnut trees, first reported in the UK in 2002 in Wimbledon and which has now spread throughout most of England. Horse Chestnut leaf miner is a small moth with caterpillars that feed inside the leaves causing brown or white blotch mines to develop between the leaf veins. Although it can cause severe damage to the leaves on an annual basis, on its own the pest does not significantly impair the trees health and they will normally grow back the following spring. The symptoms are usually easy to spot, especially as the season progresses. Horse Chestnuts produce normal foliage and flowers in the Spring and the first signs of leaf mining usually appear during June with blotches appearing on the leaves. Caterpillars or pupal cocoons can be seen within the mined areas if the leaf is held up to the light. By August most of the leaf area may be occupied by leaf mines, giving the impression that the tree is dying. Heavily infested trees will drop their leaves early, however research shows that this has almost no effect on the health of trees. Damage can be reduced by collecting and burning fallen leaves, or composting them in sealed bags which should be kept closed until the following July by which time any adult moths will have emerged and died. 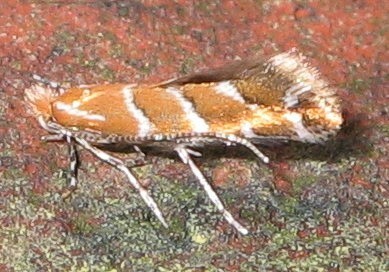 Horse Chestnut leaf miner was first found in Macedonia in 1985 and was described as a new species. In 1989 it appeared in Austria and since then has spread throughout central and eastern Europe. There is currently no requirement to report sightings of this pest, however you can help monitor its spread and contribute to research - see www.conkertreescience.org.uk.